Born in 1878 (BE 2421). Ordained as a novice at 18 and as a monk at the age of 20 at Wat Phrathat Doi Tae, Lamphun province. 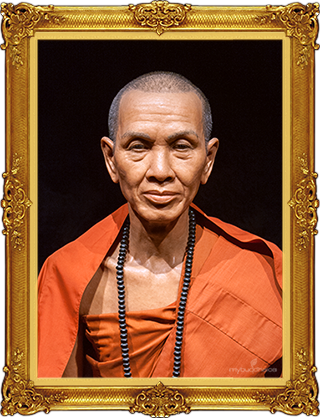 He was the spiritual leader of over 5,000 true believers and disciples, inspiring them to build an 11 kilometer road up to Wat Phrathat Doi Suthep, Chiang Mai. The road, now known as Kru Ba Srivichai road, he was completed in 5 months and 25 days. He passed away on 20 February 1938 (BE2481).